Denmark has been featured in political drama, crime series and recently Hugh Fearnley-Whittingstall’s Scandimania. So you feel you know a little of their culture and ways. Here’s a remarkable account of how the Danes acted to save their fellow countrymen and neighbours which resulted in only 5% of Danish Jews being deported to Theresienstadt transit camp in Bohemia, and over 99% of Denmark’s Jewish population surviving the Holocaust. In 1943, 7,742 Jewish citizens of Denmark—95 per cent of the country’s Jews—were spirited away to neutral Sweden with the help of their fellow Danes, under the noses of the occupying German forces. 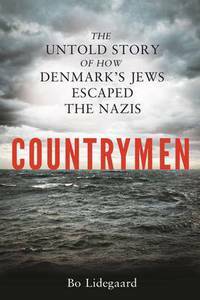 In his new book “Countrymen“, Bo Lidegaard, editor-in-chief of the Danish newspaper Politiken, recounts the “untold story of how Denmark’s Jews escaped the Nazis”.